As I have mentioned before, my new/current apartment has great closets (for NYC): I have a clothes closet by my bathroom as well as a coat closet by the front door opposite a massive 3 door closet that is divided into 1 section of shelves and 2 sections of hanging. Shown below, those two hanging sections are divided into “utility” and off season & special occasion clothes. Yes, I am very spoiled! 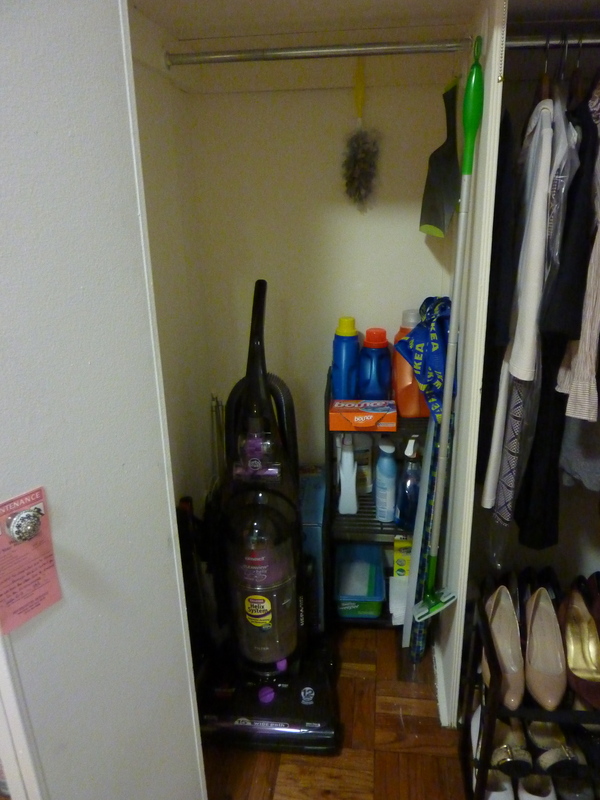 Of course closet space is only as good as the storage within it and although my utility closet has always been functional, I’ve known that I can do better. One day I received yet another new catalogue in the mail – almost in-flight shopping in style Improvements featured a rolling pantry rack on the front cover followed by many pages of fanny-pack replacements. On sale and the perfect size for my utility closet I knew I had finally found the upgrade my storage situation needed! My trick to make sure the shelves are placed at useful heights is to place common objects on the shelf you think it will live on before determining the height of the shelf above. This quick trick can save you lots of frustration when your detergent is just too tall! 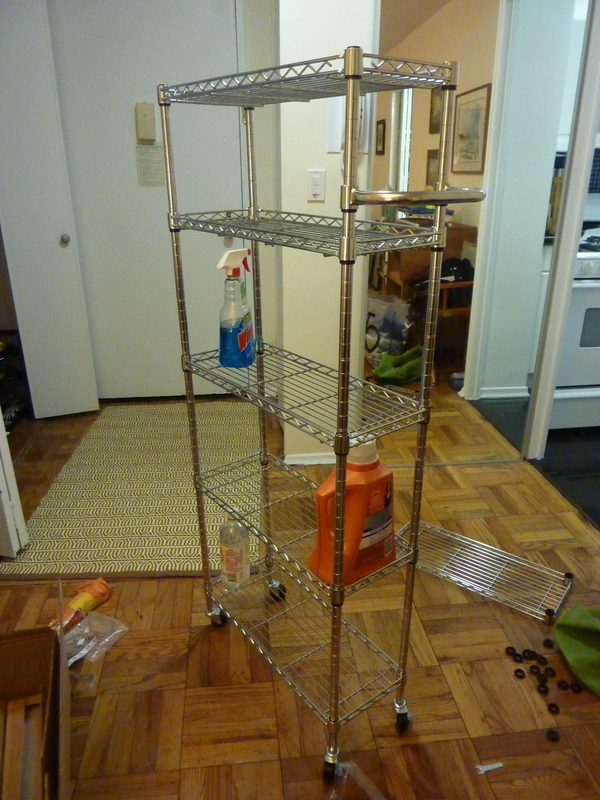 Although the cart came with the option of 6 shelves I decided that I prefer 5 set at taller heights, so the 6th metal shelf went out with the recycling. Never be afraid to adapt things this way. There is no reason to live with with the way the product was pictured if it isn’t useful to you! In the end the new rack was a huge upgrade for my closet! As you can see I am now storing much more on the new rack then I did on the old shelves. 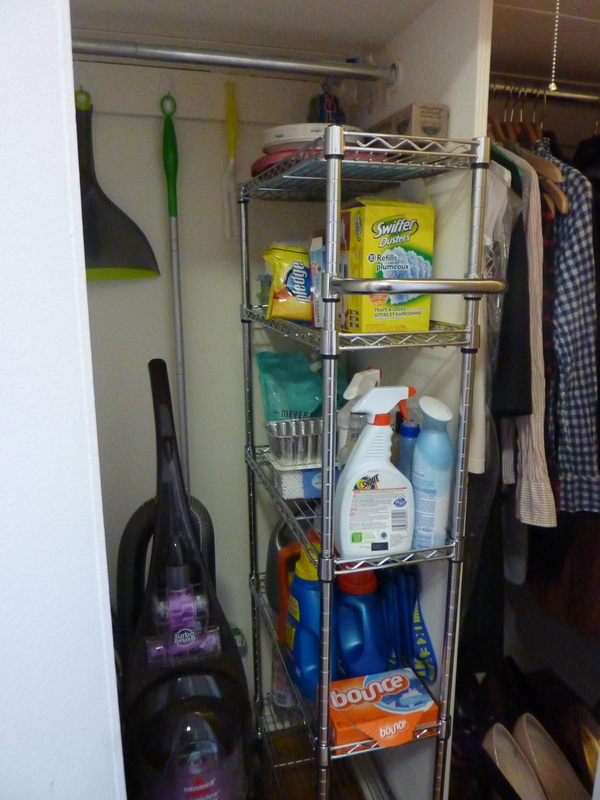 The increased space allowed me to consolidate all of the miscellaneous storage from around the apartment – a very satisfying improvement! This entry was posted in Feathering the Nest, Tips & Tricks and tagged Home Organization, Spring Cleaning, Storage Solutions, Utility Closet. Bookmark the permalink.